The Ron Brown Scholarship 2017 honors the legacy of Ronald H. Brown through a selective scholarship program that advances higher education for community-minded and intellectually gifted African Americans. RBSP competitively awards Ron Brown Scholars four-year $40,000 scholarships ($10,000 each year) to the most talented and economically-challenged high school seniors who demonstrate a keen interest in public service, community engagement, business entrepreneurship and global citizenship – the four pillars of the late Ronald H. Brown’s mission to uplift people of all races, cultures and ethnicities – especially our disadvantaged youth. Applicants for the Ron Brown Scholarship MUST be graduating high school seniors at the time of their application. November 1st (postmarked) —application will be considered for the Ron Brown Scholar Program and forwarded to a select and limited number of colleges and scholarship providers. Students must still apply to any colleges or for scholarship programs in which they are interested. January 9th (postmarked)—final deadline in order to be considered for only the Ron Brown Scholar Program. Application materials must be mailed in one packet. Transcripts and letters of recommendation should not be sent under separate cover. SAT/ACT scores must be included on the application at the time it is mailed. Incomplete, e-mailed or faxed applications will not be considered. Only semi-finalists and finalists will be notified by the Ron Brown Scholar Program office in March. Winners of the scholarship will be notified by April 1st and names will be posted on the Ron Brown Scholar Program web site, no later than May 1st. 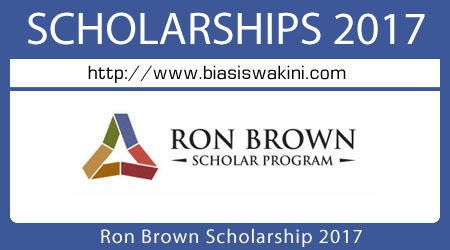 0 Komentar untuk "Ron Brown Scholarship 2017"